You are currently browsing articles tagged Craig Dietrich. This week Joline Blais and Jon Ippolito join forces for a series of presentations at USC organized by Craig Dietrich, Still Water Senior Researcher and co-creator of Scalar. The week culminates on Friday 2 March at the School of Cinematic Arts with Redesigning Reality, a hands-on session in hacking the “scripts” that govern us to make everyday life more sustaining and sustainable. 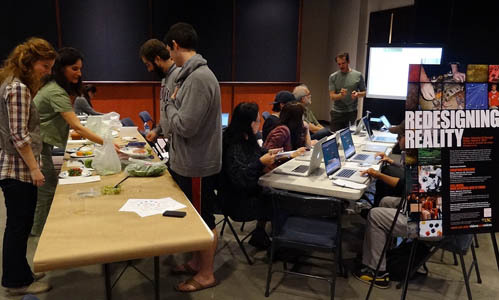 Workshop participants redesign their favorite foods and Web sites, looking to nature as a model for the victual and virtual.